For kids battling cancer, the relentless litany of medical tests, treatments, symptoms and side effects can be both confusing and demoralizing. A fun new augmented-reality mobile app from the Pediatric Brain Tumor Foundation and agency RPA aims to address both of those points by helping educate and lift the spirits of the 300,000 children diagnosed with cancer each year. A continuation of a campaign launched last year, it features a cast of animated characters—The Imaginary Friend Society—offering upbeat words of encouragement to users. Kids can pop open the app on a tablet in the hospital, for example, and get a quick pep talk from a lanky, three-eared talking rabbit wearing big eyeglasses and a bow tie. There’s a pink-haired flying unicorn with a rainbow horn and a singsong voice. There’s a toothy green moss-monster grinning supportively as flowers sprout from his head. There’s a robot, a dinosaur, a happy slug, and a bird in a sombrero. The nonprofit and agency first introduced the characters in September. They came along with a series of animated films designed to help kids understand their diagnoses and treatments. A “What is Cancer?” video, for example, features a parrot pirate captain explaining how a body is filled with tiny cells, and that bad ones can sometimes turn on the good ones—like a mutiny on a ship. Other clips address topics like chemotherapy, hair loss, and feeling sad with extraordinary compassion, creativity and practicality. 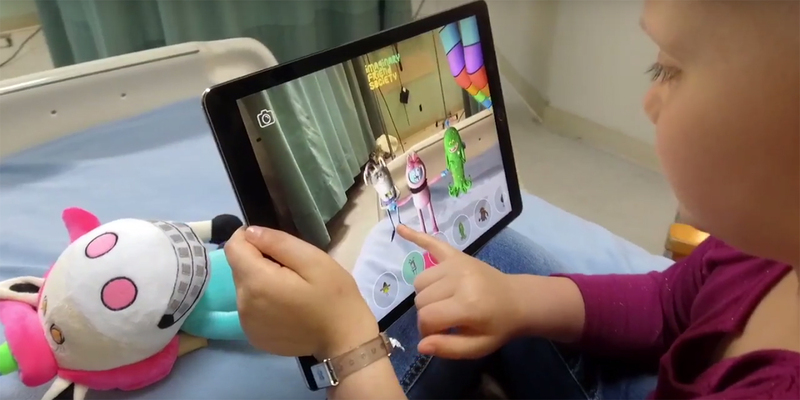 The new app, created with production company Tool of North America, trades some of the depth of the earlier narrative work for the ability to play with the characters in real time—bringing them to life as a powerful toy that the marketer hopes can allay some of the anxiety prevalent among children who are cancer patients. It’s also a great way to draw renewed attention to the animations launched last fall—a valuable primer on what cancer patients face, and for grown-ups, how to talk about it with kids. Those videos are served up bedside via touch screens in select children’s hospitals around the U.S., as well as some abroad.